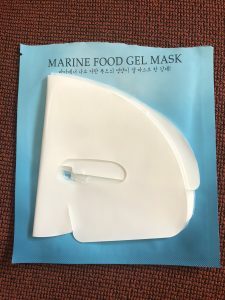 SKINFOOD Sea Cucumber Marine Food Gel Mask is part of the 5 hydrogel masks from the Marine food series launched by SKINFOOD couple of years ago. They are not easy to find in EU even though they are of an excellent quality for people with oily skin type. This particular Sea Cucumber mask is my 2nd favorite from the entire range after Jellyfish mask. 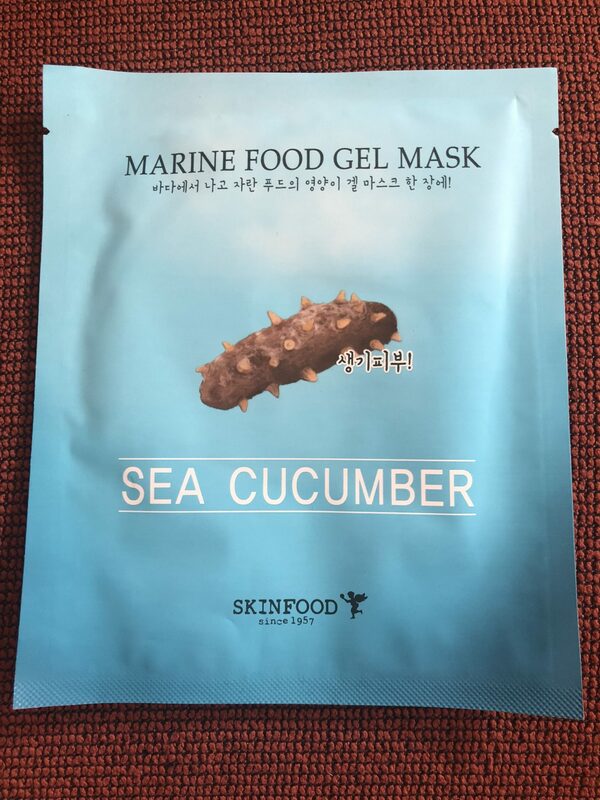 Sea cucumber extracts and blue marine complex offer intense hydration in the form of this refreshing hydrogel mask. Sea cucumber peptides help to stimulate the formation of new collagen to help reduce wrinkles. Benefits include a smoother and more youthful appearance. After cleansing and toning, open package and unfold mask. Remove film, gently apply the side with the film onto your face. Leave on for 10-20 minutes. Remove mask, then tap or massage remaining essence into skin for complete absorption. 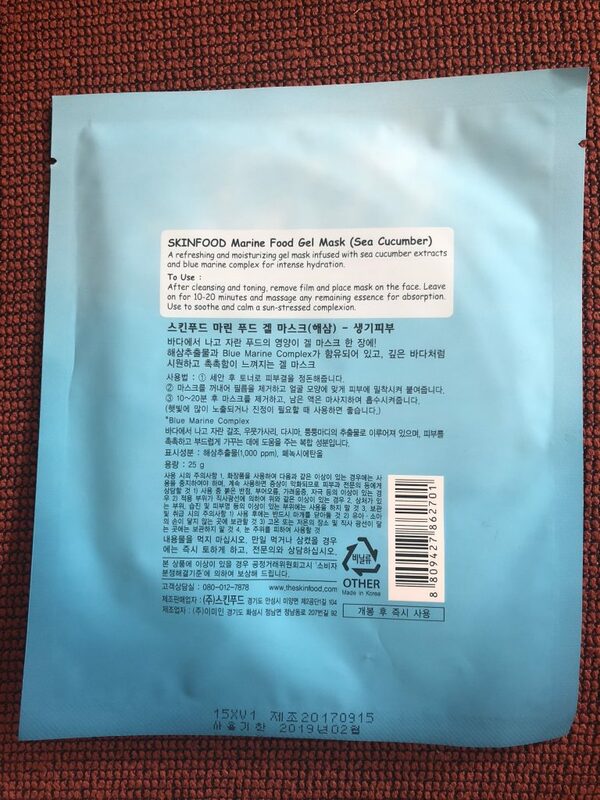 To me this SKINFOOD Sea Cucumber Hydrogel mask is a good skin refreshing and hydrating mask that is a good make-up base for the day. The mask comes in gorgeous blue packaging that is easy to open. Unfortunately the back side is all in Korean so no idea what it says there. Inside the pack there are 2 pieces of hydrogel (for upper and lower halves of the face). Each piece is protected by 2 pieces of plastic shielding, one thinner and one hard one. The scent of the essence is amazing. It seems like the same type of fragrance is used in scenting each and every mask from this range. The fragrance is floral and marine at the same time. Very yummy. Essence is transparant and semi-liquid ensuring that this mask won’t glide of your face. The adherence and fit are as good as they can get. 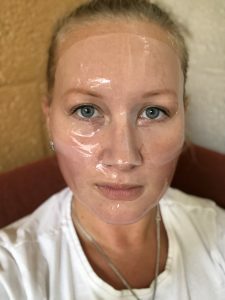 The luxuriously thick gel hugs my face in the right places. The eye cutouts are also well positioned and have a nice cut so that the edges of the mask don’t irritate the area close to my eyes. There is a thin sheet of fabric embedded in the gel and sometimes they may cause irritation in the areas with sensitive skin. After 40 minutes my skin is supercharged with moisture. What is very lovely about this mask is that it leaves little to no tacky residue. My skin is plump, fresh, slightly brighter, very hydrated and cooled down. Loving this mask series a lot. Would I recommend it? Yes, if you have oily and dehydrated skin. This version and the seaweed one are most suitable for you. If your skin is more on the normal-dry side, get the oyster or sea cucumber mask.